The Fort Staunton Construction Site in GTA III, as viewed to the south. The Staunton Plaza construction site bearing a Panlantic logo serves as the centerpiece of Fort Staunton. The Fort Staunton Construction Site is, as the name states, a construction site in Fort Staunton, Staunton Island in Grand Theft Auto III. It is the starting point for Asuka Kasen's second string of missions, and is the location of a major gang battle between the Yakuza and the Colombian Cartel. In GTA III, set in 2001, the area is in the process of a large-scale redevelopment with the construction of Staunton Plaza (due to be completed "next fall"); much of construction site has also been dug out. Panlantic Construction Company, in charge of the area's development, is suspected by the LCPD to be one of the many fronts for the Colombian Cartel, which may explain the presence of Cartel members and gang cars in the area. It is presumed that, following events in GTA Liberty City Stories, that the Colombian Cartel-controlled Panlantic Construction Company eventually moved in on Fort Staunton's redevelopment, clearing away nearly all remnants of district in preparation for the groundbreaking of Staunton Plaza. As Panlantic is affiliated with the Colombian Cartel, Fort Staunton is depicted in GTA III to be under the control of the gang during early progression of the game's storyline. However, with Donald Love orchestrating the murder of Yakuza co-leader Kenji Kasen to falsely implicated the Cartel and instigate a gang war between the two factions, the Yakuza launched an offensive into Fort Staunton, leading to Yakuza members appearing on the streets, frequently engaging in firefights with the Cartel. The Fort Staunton Construction site is a spawning point for the Cartel Cruiser, making it a good place for the player to visit if they require a Cartel Cruiser for certain missions, such as the missions Liberator and Waka-Gashira Wipeout!. 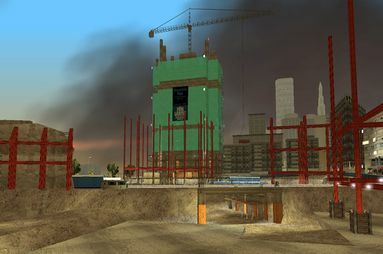 The Fort Staunton Construction Site plays a major role in the mission Grand Theft Aero, where the player has to enter the construction site and kill Cartel mobsters to retrieve a package belonging to Donald Love. Coincidentally, Asuka Kasen and the Yakuza, angered at the death of Asuka's brother Kenji Kasen, launches an all-out attack on the Fort Staunton Construction Site, killing the Cartel mobsters present and capturing Cartel leader Miguel in the same attack. Asuka then begins to use the constution site as her base of operations, torturing Miguel into revealing Cartel secrets, which she uses to her advantage in the Yakuza's war aginst the Cartel. Yakuza Stinger (After the completion of Grand Theft Aero.) There will be 3 Yakuza Stingers; 2 in front of the 2nd building that houses a health and armor pickup, and another near the lift. This page was last modified on 9 January 2012, at 01:28.